The 12-year-old plays often, usually with older players, and sometimes with the national team. His goal is to play for Canada at the Paralympics. Between March 15 and 17, War Amps Child Amputee Program (CHAMPS) sponsored a BC Child Amputee Conference at the Sheraton Vancouver Airport Hotel in Richmond for kids like Pellizzari. He’s one of the organization’s champions or CHAMPS, outstanding examples of children with amputations who excel. This two-day seminar offered peer support, workshops for child amputees, and networking. Sara LaBelle, 21, volunteers as a CHAMPS junior peer counsellor. Her right leg was amputated when she was aged four because of a medical condition. Workshops deal with topics such as staring, bullying, and healthy habits. “It’s just everybody talking to each other with the experienced CHAMPS. The organizers have sessions we go to where they explain things and share tips, like what to do and what not to do,” says Pelliizzari. LaBelle says War Amps has done a lot for her. For children, they cover topics such as entering high school and how to deal with teasing, she says. Talking of her amputation at a young age, LaBelle says she grew up with an artificial limb. The association has provided more than emotional support and advice. In both cases, War Amps has provided additional artificial limbs such as waterproof legs, ones that don’t have as many features but you can use to shower, swim and hang out at the beach. Pelliizzari has special legs for running, donated by War Amps through the CHAMPS program. Pellizzari says he has an active life, from golf and volleyball to skiing and swimming. Each activity can rely on a different kind of leg. Each artificial limb can cost thousands. Since he is a double amputee, in Pellizzari’s case, all costs are times two. “War Amps has paid for pretty much all that I need. I’m so grateful. I wouldn’t be able to do almost all the things I do without War Amps,” he says. 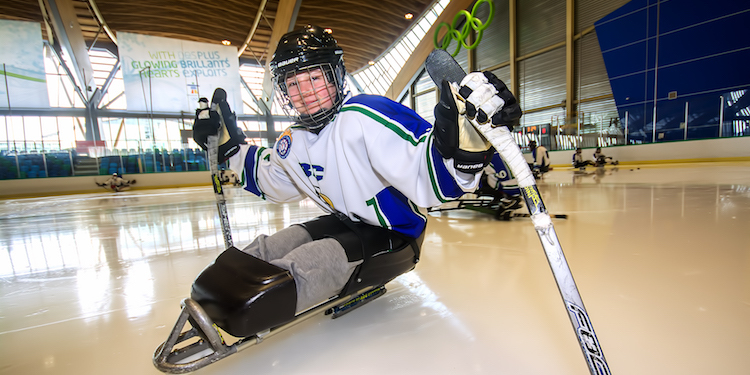 But his passion is sledge hockey, he says. It’s a big part of his life, he says. “I do it about three times a week. I play with adults because B.C. hasn’t really gotten a grip on it yet. They have a team but it’s not anywhere near Ontario and Quebec. They have it down to a fine T. That’s a big thing there for disabled people.” He says he usually plays forward centre. Pellizzari is finishing elementary school and says he’s been really lucky. But he recognizes that’s not the case for everyone. War Amps helped LaBelle with driving lessons and university where she studies biology with an eye to working in health care. What would she say to someone facing an amputation? What does Pellizzari want to do when he grows up? It’s not just War Amps who’ve made the difference for these two young people. Both credit their families. “Obviously, my parents know that I have all the capabilities of anyone without a disability,” says Pellizzari.